Muay Thai promotion “Thai Fight” marks its tenth anniversary with the event held this coming Saturday (Mar. 30) at CentralPlaza Nakhon Si Thammarat. The lineup features nine bouts with local and international competitors representing Iran, Sweden, Italy, Russia, Estonia, Uzbekistan and Ukraine. Saenchai battles it out on the top of the fight-bill. Making his second appearance inside the ring in one month, the famed Thai fighter faces Javad Bigdeli of Iran. The bout is scheduled for three rounds at catchweight with the limit of 66 kg. 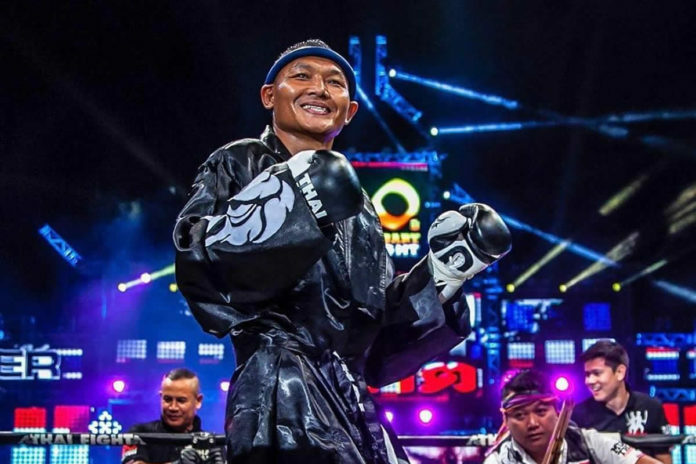 Early March Saenchai, the four-division Lumpinee Boxing Stadium champion, visited the UAE where he scored a unanimous decision against Valerii Abramenko in the headliner of “Fight Night Dubai”. Bigdeli is known for his battles in Khmer Boxing in Colombia where he faced Thol Makara, Tha Sarun, among others. The rest of the card features a series of matchups in Kard Chuek where instead of boxing gloves the rope is used around hand and forearm. The complete lineup can be found below.